Hi The Mulvihill Group Friends! 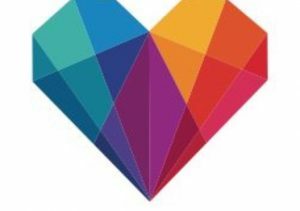 To kick off 2019 with a bang we wanted to blog about some pretty awesome local charities in Livingston County! We all know the longer established ones out there, but there are some newcomers that are unique and so very special to the Brighton Area community. Everyone should know about them! Something that is very special about each of these charities is that each came from pain and heartache, some a devastating loss, turning something tragic into a mission to helping and giving back. The first notable foundation that we’d like to share about which was truly our motivator in this blog, is Fund A Life in Brighton, MI. Founders are Mark and Christina Howell. Mark and Christina started the Fund A Life foundation in 2017. Mark had battled Stage 4 Melanoma Cancer, a diagnosis given shortly after his first child Gabriel was born. Mark was given just weeks to live, yet instead community fundraisers that raised hundreds of thousands of dollars for Mark gave him the financial means to travel the country and find his cure. Mark maintains no evidence of disease and is absolutely thriving, or as he would say, “Dominating” with his wife Christina, son Gabriel, and his twins Luke and Lilly. They have a beautiful family and a mission to spread the word of the Lord while helping other families in need facing dark circumstances like they once did themselves. The Howell’s mission of giving back after being so greatly blessed with Mark’s recovery is truly inspiring. Mark left his Director position at Visiting Angels in June of 2018 to dedicate 100% of his efforts to Fund A Life and impacting people’s lives in time where hope is desperately needed the most. Fund A Life has kicked off various fun and exciting fundraising events for their foundation and has already been of great relief to families in the area, “funding lives” that need financial assistance to get through their unique health related hardships that rock their families to the core. Fund A Life has a unique way of accounting for their operational costs. They establish Mission Partners (individuals or companies) that come alongside Fund A Life with large financial commitments that are designated to running and growing the business so that 100% of donor and fundraising event dollars can go to the mission and people in need of their assistance. They are early on in this process, yet have already accumulated a number of Mission Partners and are actively seeking to establish more! Fund A Life currently consists of a board of seven directors consisting of local leaders and community supporters: executive director and founder Mark Howell, the only current employee, and a group of six dedicated volunteers that all work together to make this mission come to life. Christina is a huge success in her partnership with Younique, a direct sales make-up company that also has their own valuable mission in empowering women that are victims of sexual abuse. Christina has done very well selling for Younique and uses all of her profits for Fund A Life; supporting two very important missions in one line of business! The products are really great, we’ve personally tried some of them. And if you follow her on Facebook, you will see entertaining Make Up Tutorial videos by Christina with occasional surprise guest appearances by Mark that are always comical. Mark’s personality defines the rule of “laughter is the best medicine”, however, that being said, treatment is necessary and costly no matter how good your disposition is and families need help. Mark and Christina’s mission is to help those families in their most bleak times find love, light, and hope by funding that can help them do what they need to do in their journey to get to proper methods of treatment and ultimately heal with less financial stress. We commend Mark and Christina for starting Fund A Life before he was even clearly out of the woods with cancer. 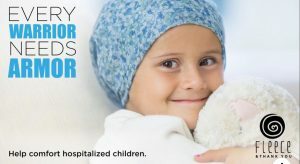 You can find all contact and social media information on their website at www.fundalife.org . USA HOCKEY FOUNDATION’s – The Darian Locklear Hockey Grant was created through support of the Brighton community and the USA Hockey Foundation by Troy and Regina Locklear in memory of their daughter Darian Locklear. 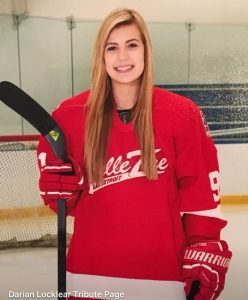 Darian was a Brighton High School girl that tragically died in a car accident driving to hockey practice in February of 2018. Darian was a kind and gentle soul that is remembered for her warm personality and being as beautiful on the inside as she was on the outside. The hockey grant was mostly funded by the money collected from the community when a fellow classmate of Darian’s, Matt Duncan started a Go Fund Me account. $40,000 was raised in just a couple months! That money was then turned over for USA Hockey to manage, with the Locklear’s involvement on the process every year moving forward. Monies go to helping girls get funding to play college hockey. This year they have given away a total of $13,000 to 5 different girls from local teams. You can go to the USA hockey website for information on how to apply. The Locklears have also started the Darian Locklear Project, which has a goal of promoting kindness in schools. They started by going into grades 4-7 classrooms talking about treating people with kindness. Spinning off of the Darian Locklear Project, the Locklears started The Darian Locklear Kindness Scholarship to be awarded to two BHS seniors annually who have been selected for their ongoing kindness. The first awards will go out this May and will total to approximately $4,000. 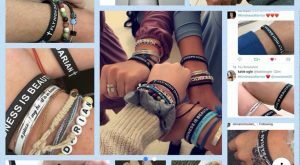 All of that money has come from t-shirts and bracelet sales to make awareness to “Live Like Darian” and “just be kind”. There is a Facebook page you can follow called, Darian Locklear Tribute Page. 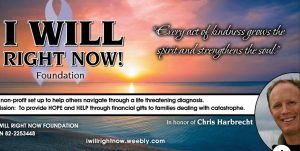 I Will Right Now was founded by Keri Harbrecht, Michelle Letendre, Karen Storey, and Bill Trombley. 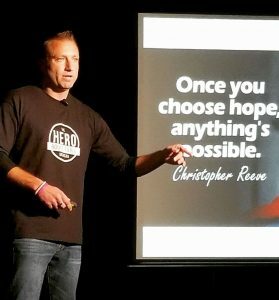 This foundation was created in memory of Chris Harbrecht after Keri Harbrecht tragically lost her husband Chris to cancer. Chris was a father of 3 and was known in the area for being a very well respected, kind, generous man of great faith. Keri Harbrecht has been a well loved and respected teacher in Brighton Area Schools for some time. She was my teacher, and I can attest that she is very special, so it is no surprise to me she co-founded I Will Right Now so soon after going through such heartache. I Will Right Now has been gifted over $65,000 in aide to Brighton families this year, thanks to donations from their generous community members. It’s truly amazing how the Brighton community comes together for a good cause. You can fill out an application for assistance at www.iwillrightnow.com . Other contact information is on the website as well. Fleece & Thank You was founded by Nick Kristock and Bryce Goulah and is run out of Novi. They were inspired to start this foundation by their young four year old friend Sophie battling neuroblastoma. Knowing how intimidating a hospital experience like this is for an adult, how cold the hospital room looks, and going through treatment actually physically is cold, they decided to brighten sick children’s’ rooms with hand made fleece blankets. Their website shows some of these children with their blankets and you can see how comforted they are by the blanket. The sense of warmth and security it brings is very heartwarming. What a special gift for these children. Fleece & Thank you has currently brought 41,006 fleece blankets to children so far! The foundation offers an array of programs and events to benefit children in the hospital setting and the disabled population as well. You can check out their website for more information on their programs and process at www.fleeceandthankyou.org . The Mulvihill Group has always liked to toot local businesses horns on our social media as we feel community support is so important. Right now feels like a great time to do that for these local charities! We know the holidays can sometimes break the bank and make it hard for families to put charities before their children’s and family gifts when working on a tight budget, so what a better time than ever leading up to tax refunds than to give charitably after getting your financial cushion back. 😉 Whether big or small, every donation counts! A lot of littles can add up to a lot!